Having a passion for skateboarding since childhood, the Japanese artist known simply as Haroshi knows that the more rigorously one devotes themselves to mastering maneuvers on their deck, the more all of its parts become damaged, worn out, and eventually break. This is a truth that he experienced for himself, Haroshi opting to keep his first board even after it became unusable. And then, one day, he glanced upon that old skateboard and envisioned using it as the raw material from which he could create art. 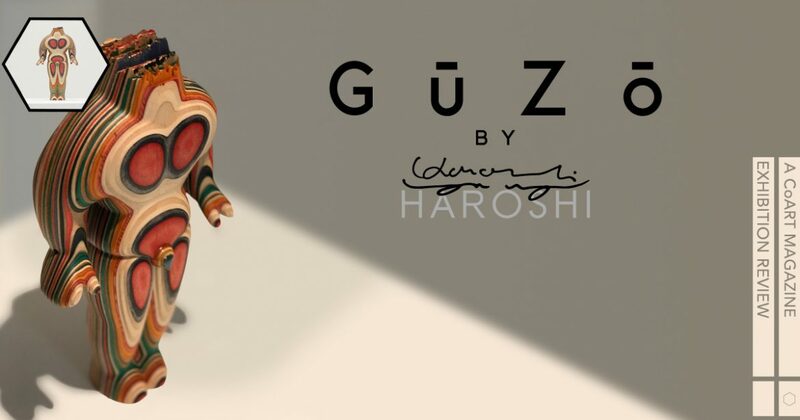 Such is the legend of how Haroshi’s craft began, which he’s been evolving since 2003, recent examples of which comprise his solo exhibition Guzo. A self-taught woodworker, Haroshi’s sculptural works are created through stacking “salvaged” skateboard decks into wooden blocks, which he carves his pieces out of. And because skateboard decks are made of layers of processed wood, the final sculptures appear to have striped surfaces that decorate the pieces alongside painted elements and polished, veneered finishes. This exhibition features a series of over twenty works that are each referred to as Guzo, or “Gūzō” (偶像), the Japanese word for “idol” or “statue”, an appropriate title due to the humanoid shapes and fire hydrant forms being reminiscent of tribal icons. With the main statuary display on a semi-circle pedestal, the pieces range from 3⅘ to 21 inches in height, many imbued with a sense of modernity through their stances and facial expressions. Understanding how these pieces are created and viewing the reverence with which they are presented, one doesn’t get the impression that the skateboard decks are simply being recycled into material for the pieces. There is a sense of salvation, that the artist’s affection for skateboarding has steered him to giving life anew to these worn-out decks. Located apart from the main display is a single Guzo sculpture, it’s roughly hewn neckline drawing more attention due to the piece’s isolation. A reminder of the work’s origin, being evolved from worn-out skateboard decks, this aspect also serves as a visual cue to a hidden element in all of Haroshi’s sculptures, wherein he places a broken skateboard piece into the core of each one. This practice was inspired by Unkei, a 13th-Century Japanese sculptor who placed crystal eye inlays into his depictions of the Buddha and other important Buddhist figures, giving a glimmer of “soul” to his works. Similarly, for Haroshi, the broken pieces within his sculptures are their “souls”, remembrances of where the wood was salvaged from. And a final aspect of the Guzo exhibition was a quarter-pipe skate ramp, an installation object created out of refurbished decks. And while attendees were asked to refrain from skateboarding at the venue, this curved runway’s presence serves as a crowning reminder of where the artist’s affections lie, with the skateboards that inspire — and become — his sculptural art. 2-17-3 Shibuya Shibuya-ku Tokyo 150-0002 Japan).